One of the more pleasant surprises for many people was 2011's Captain America: The First Avenger. It was a different kind of superhero movie - one that took place during World War II (for the most part). Director Joe Jonston did a great job of capturing the look and feel of the 1940's while still giving the film modern sensibilities. It was very similar to his early 90's movie, The Rocketeer in that regard. Fast forward three years (two years past the monumental Avengers movie) and you've got Steve Rogers, aka Captain America, living in modern America. He's still a fish out of water (and his stereo has 40's Big Band Jazz playing, as it should), but he's starting to acclimate himself to a brave new world. He's still an idealist, and the same reasons why he kept trying to get into the military as a scrawny 100 pound weakling still apply in his mind to what is right and what is wrong. He doesn't agree with SHIELD's plans to pro-actively take out threats to world security. Punishment before the crime is committed doesn't seem right to Steve. Freedom still means a lot to him. Needless to say, there is plenty of action in The Winter Soldier (which could also have been called, "The Avengers 1.5"). This isn't a small movie. However, there are elements of 1970's style political thrillers present, as well as a bit of a mystery. This, like The First Avenger, is a well rounded movie with a lot going on. One of the things going on is the appearance of The Winter Soldier, an assassin so effective and so elusive that many believed him to be just a myth. The identity of The Winter Soldier is probably pretty well known by now, but I'll avoid spoiling it just in case you don't know yet - but, needless to say, it does create further conflict for an already deeply conflicted Steve Rogers. And as Steve Rogers Chris Evans has been, and continues to be, amazingly effective. A far cry from the brash, thoughtless, impulsive Johnny Storm that he played nearly a decade ago in a pair of Fantastic Four movies, Evans' Steve Rogers is thoughtful and mature. Wise beyond his years in the 1940s his wisdom is desperately needed in modern times, and Evans perfectly captures that. His performance isn't just seriousness and contemplation - he is (as he was in The Fantastic Four movies) excellent with the one liners. Evans has a great balance between the serious character drama and the lighthearted nature of fun comic book movies. A better Captain America would have been hard to find. But the great performances don't stop there. Scarlett Johansson is a pleasure to watch as Natasha Romanoff, aka The Black Widow. Her charm is inescapable. Also very noteworthy in the cast is Robert Redford - yes THE Robert Redford - as SHIELD supreme commander, Alexander Pierce. Redford gives a standard Robert Redford performance. It's not Redford at his absolute best, but he isn't just phoning it in, either. Average Redford is better than most actors at their best, and that's the case here, and his presence alone gives the film a certain weight and gravitas that it couldn't have had with just another actor in the role. Kudos to Marvel for landing him! Samuel L. Jackson is Samuel L. Jackson as Nick Fury, which makes sense as the character was re-imagined in his image for Marvel's, "Ultimates," line of comics (a line where everything was started over from scratch and given a modern spin). Newcomer to the Marvel universe, Anthony Mackie, also brings a lot to the table as Sam Wilson, aka The Falcon. In the comics The Falcon was Captain America's partner in crimefighting for about a decade. In the movie he is a valuable asset as both a character and as an actor giving the cast a new dimension that wasn't seen in The First Avenger or The Avengers. The story is more than solid. It is well thought out, and well scripted. The Winter Soldier really could be subtitled, "Avengers 1.5," because that's what it is, more or less. There is enough excitement to satisfy that crowd, and enough twists and turns to satisfy the skeptics. Directors Joe and Anthony Russo (the Russo brothers) have done a great job of bringing not only a comic book to life, but of also adding elements of political intrigue and mystery to the comic book superhero action movie mix. The movie moves at a breakneck pace, but still finds time for solid character moments and plot development. 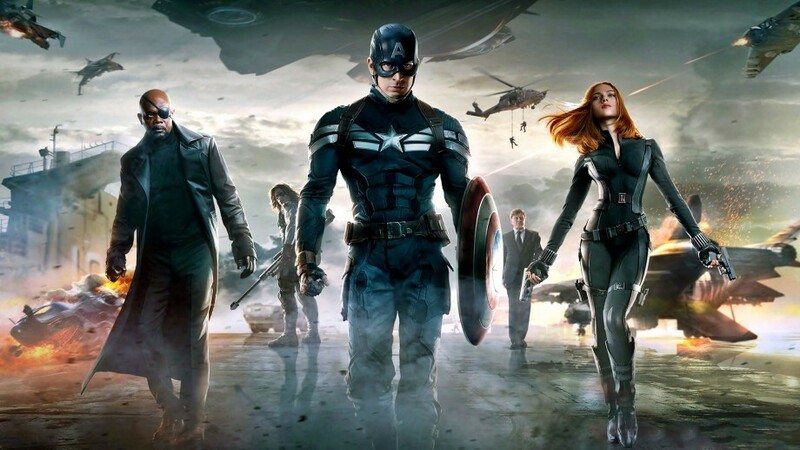 The Winter Soldier will end up being one of the highlights of 2014 at the movies. Don't miss it. Review Update: Having seen the movie a second time it was actually better the 2nd time through. The rating has been revised upward from 4.25/5 to 4.5/5 as a result.